Scientists have predicted that ocean temperatures will rise in the equatorial Pacific by the end of the century, wreaking havoc on coral reef ecosystems. But a new study shows that climate change could cause ocean currents to operate in a surprising way and mitigate the warming near a handful of islands right on the equator. As a result these Pacific islands may become isolated refuges for corals and fish. Here’s how it would happen, according to the study by Woods Hole Oceanographic Institution scientists Kristopher Karnauskas and Anne Cohen, published April 29 in the journal Nature Climate Change. 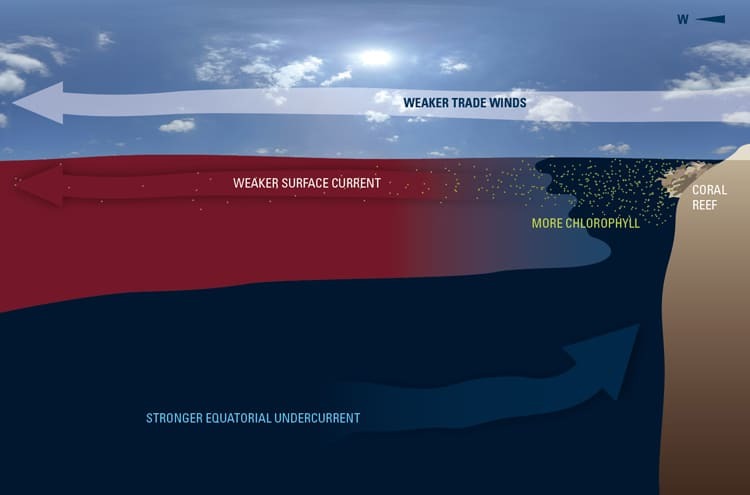 At the equator, trade winds push a surface current from east to west. About 100 to 200 meters below, a swift countercurrent develops, flowing in the opposite direction. 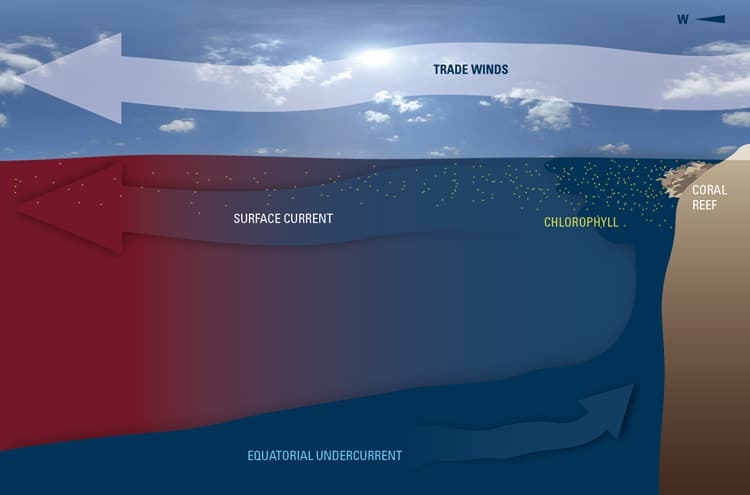 This, the Equatorial Undercurrent (EUC), is cooler and rich in nutrients. When it hits an island, like a rock in a river, water is deflected upward on the island’s western flank and around the islands. This well-known upwelling process brings cooler water and nutrients to the sunlit surface, creating localized areas where tiny marine plants and corals flourish. 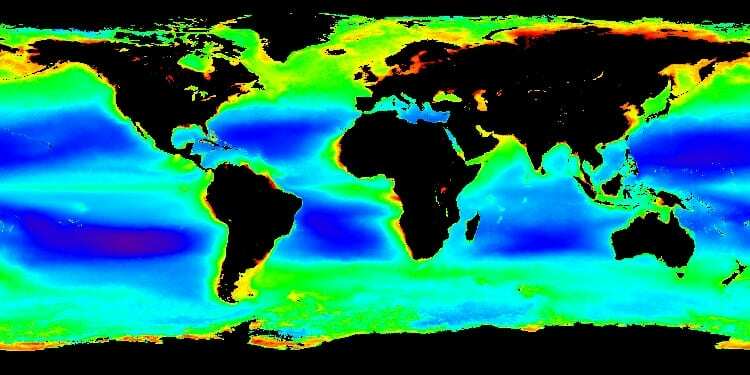 On color-enhanced satellite maps showing measurements of global ocean chlorophyll levels, these productive patches of ocean stand out as bright green or red spots, for example around the Galapagos Islands in the eastern Pacific. 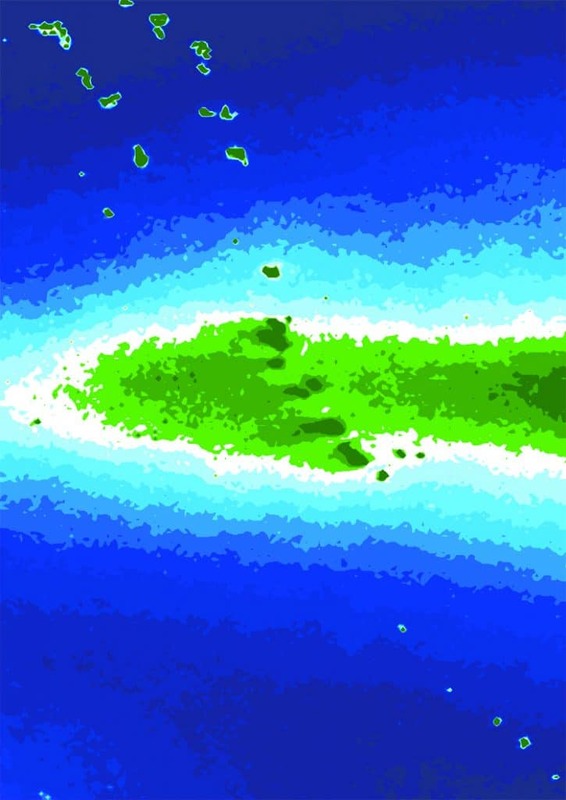 But as you look west, chlorophyll levels fade like a comet tail, giving scientists little reason to look closely at scattered low-lying coral atolls farther west. The islands are easy to overlook because they are tiny, remote, and lie at the far left edge of standard global satellite maps that place continents in the center. Karnauskas, a climate scientist, was working with WHOI coral scientist Anne Cohen to explore how climate change would affect central equatorial Pacific reefs. When he changed the map view on his screen in order to see the entire tropical Pacific at once, he saw that chlorophyll concentrations jumped up again exactly at the Gilbert Islands on the equator. Satellite maps also showed cooler sea surface temperatures on the west sides of these islands, part of the nation of Kiribati. So Karnauskas and Cohen began to investigate how the EUC would affect the equatorial islands’ reef ecosystems, starting with global climate models that simulate impacts in a warming world. Global-scale climate models predict that ocean temperatures will rise nearly 3oC (5.4oF) in the central tropical Pacific. Warmer waters often cause corals to bleach, a process in which they lose the tiny symbiotic algae that life in them and provide them with vital nutrition. 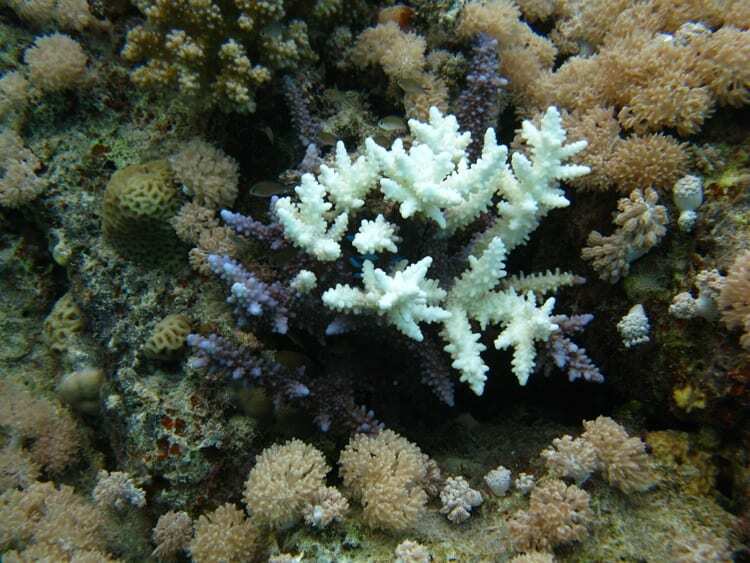 Bleaching has been a major cause of coral mortality and loss of coral reef area during the last 30 years. But even the best global models, with their planet-scale views and lower resolution, cannot predict conditions in areas as small as small islands, Karnauskas said. “Global models predict significant temperature increase in the central tropical Pacific over the next few decades, but in truth conditions can be highly variable across and around a coral reef island,” Cohen said. “To predict what the coral reef will experience under global climate change, we have to use high-resolution models, not global models. A handful of coral atolls on the equator, some as small as 4 square kilometers (1.54 square miles) in area, may not seem like much. 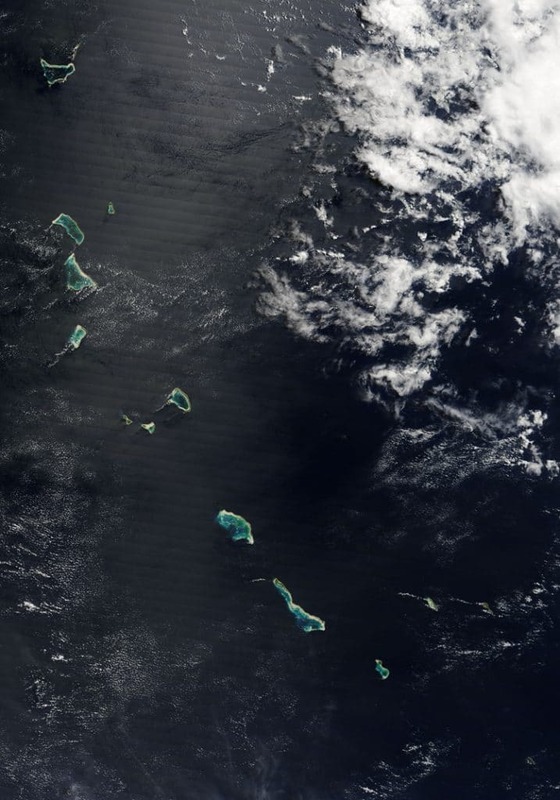 But Karnauskas’s and Cohen’s results say waters on the western sides of the islands will warm more slowly than at islands 2 degrees (or 138 miles) north and south of the equator that are not in the way of the EUC. That gives the Gilbert Islands a significant advantage over neighboring reef systems, they said. “The finding that there may be refuges in the tropics where local circulation features buffer the trend of rising sea surface temperature has important implications for the survival of coral reef systems,” said David Garrison, program director in the National Science Foundation (NSF)’s Division of Ocean Sciences, which funded the research.